Strong neodymium magnets are often used in Magnetic Water Treatment to prevent or reduce scale formation with hard water. Does this really work? Is it fact or myth? K&J reviews the available information and experiments a bit on this controversial subject. Hard water has a high mineral content, usually consisting of mostly calcium and magnesium. In fact, the measure of water hardness is expressed in various units that express how much calcium carbonate is in a given volume of water. Units include ppm (parts per million), gpg (grains per gallon), or mg/L (milligrams per liter). Hard water isn’t necessarily bad for you, but it can pose problems with the plumbing in your home. It can form hard deposits of calcium called scale, affecting faucets, shower-heads, dishwashers, and heating elements of water heaters. This can reduce water flow, heating efficiency, and leave spots on dishes. It can also require more soap to get good suds. How do conventional water softening systems work? Conventional water softeners work with an ion-exchange process, where the calcium and magnesium in the water are replaced by sodium. This technology is proven, works consistently and does make water softer. It does reduce scale in your plumbing. You can find water softeners at your local hardware or home improvement store. Softened drinking water contains sodium. The added sodium in your diet depends on how much you drink and how hard the incoming water is. When this is a concern, a non-softened water tap is used for drinking and cooking water, which adds to installation costs. Soap can be harder to remove when washing hands with soft water, which results in a slippery feeling. Conventional salt-based water softeners require periodic additions of salt to the system. Conventional salt-based water softeners periodically run a regeneration process, where the removed calcium and magnesium is washed out, dumping water down the drain. The amount of wasted water depends on usage and the hardness of the incoming water. While scale in plumbing clearly has bad side effects, sodium might also cause corrosion issues. Some studies suggest that the calcium scale can help prevent corrosion of steel parts. Some people don’t like the taste/feel of soft water. This is really a personal preference. How does magnetic water treatment work? This is one of those topics where a quick search on the Internet provides wildly varying results. There isn't much clear information about magnetic water treatment, and some sites say it doesn't work. There is a great deal of mis-information that seems to either make false claims or appear to be scientifically bogus, further complicating the search. Magnetic Water Treatment directs water to pass through a strong magnetic field. By placing two strong neodymium magnets on either side of the incoming pipe, all the water passes through a strong, uniform magnetic field. Magnetic water treatment does not remove any calcium from the water. Technically, it is still just as hard as before it passed through the magnets. It claims to change the structure of the deposits that form, making them tend to be less apt to stick to surfaces. Perhaps the biggest reason is that the results are hard to measure. With conventional, salt-based water softening, it’s easy to measure the amount of calcium dissolved in the water. Simply measure the calcium content before and after the treatment. If you’ve got less calcium in there after treatment, you know it’s working! 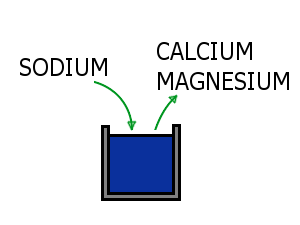 With magnetic water treatment, no calcium is removed. Measuring calcium content before and after shows the same amount in the water. That might lead to you believe it doesn’t do anything at all! Is there any decent published data? We have read heard a lot of anecdotal evidence about how well magnetic water treatment works. Still, no amount of stories equate to scientific evidence. Some of us here at K&J Magnetics use magnets on our water source at home, some don’t. Are there any scientific publications that can help? Unfortunately, many who refer to his work also make some pretty wild claims, putting the reliability of these results into question. We haven't read his paper, but references online just list his opinion on the matter. Is there a more reputable source on the subject? The Wikipedia article on Magnetic Water Treatment points to a paper by J.M.D. Coey and Stephen Cass. “Magnetic water treatment” appeared in the Journal of Magnetism and Magnetic Materials #209 back in 2000. Professor J. M. D Coey edited an early, important text on rare-earth magnets, Rare-Earth Iron Permanent Magnets. More recently he authored Magnetism and Magnetic Materials, a graduate level textbook about magnetism. That’s a large percentage of the magnet textbooks we own! More to the point, we can’t imagine a more reputable source for scientific answers on this subject. We refer to his textbooks often. What does the paper say? 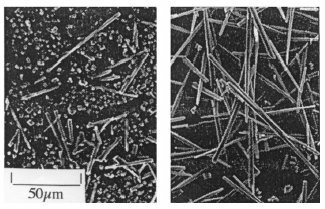 Images from an electron microscope showing carbonate deposits from untreated (left) and magnetically treated (right) water. They tested MWT by passing water through a magnetic field of 1000 Gauss (0.1 T). The samples were then heated in open beakers, forming scale when the water evaporated. The scale was inspected by X-ray diffraction (which can reveal what it’s made of) and an electron microscope (to view the structure). The results confirm earlier claims that there are two different types of calcium deposits made: calcite and aragonite. They are both made of the same stuff (calcium), but form in different structures. The small beads of calcite tend to make hard scale that clings well to surfaces. Aragonite forms in longer shapes which are less prone to form hard scale, and keep moving along with the water. The electron microscope shots are pretty clear! The data they collected also confirms that the effect can last over a period of time, as much as 200 hours. They reported visible, measurable differences. To some extent, it does have an effect. Magnetic water treatment isn’t completely bogus. There is a real, observable, physical effect. The paper indicates that the ratio of the kind of calcium that tends to stick (calcite) compared to the kind that doesn’t stick (aragonite) does improve with magnetic treatment. This should mean there is less scale formation. Scale doesn’t drop to zero, though. It doesn’t claim that you’ll get absolutely no scale deposit. 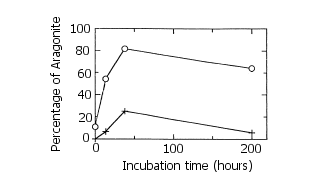 The paper confirms that the effect last over many hours and days. Since treated water often sits in a water heater for some time, this is great news. The research did not test how magnetic water treatment changes scale formation in your pipes or water heater. It sounds like it should improve it, but the specific application was not tested. They reported variability with different water sources. This tells us it might work better in some places. This might account for the variability in anecdotal results described online. We took two samples of hard water, known to have a hardness of about 14 grains. After passing one through a 3000+ gauss magnetic field, we heated the water to form scale. 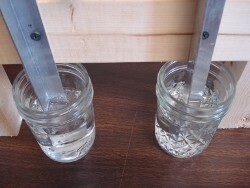 Did the magnetically treated water form less scale in this test? No, not really. We saw about the same amount of scale. Of course, we were heating open containers, allowing the water to evaporate. This isn’t really comparable to what’s going on inside a water heater. The interesting result is that the scale in the two samples did seem different in how well it stuck to the aluminum heater. We ran our finger across the evaporated deposits and didn’t get any calcium on our finger with the untreated water. One rub across the magnetically treated water yielded a bunch of white calcium stuck to our finger. Some of the deposited calcium did not stick to the heater quite as well as the untreated water deposits. Does this mean that some of the calcium was less sticky? Sure. Could this be indicative of a higher aragonite percentage? Maybe. We would like to see a test rig that might simulate a water heater. Run two systems, one with and one without magnetic water treatment. It’s a long-term test, but the results would surely be interesting. What magnets should I use for Magnetic Water Treatment? The test setup we used had a field strength of just over 3,000 gauss in the water pipe. The paper we referred to said that only a 1,000 gauss field was used. What strength is required? We’re not sure, but here is a list of a few suggested sizes arranged by the size of common US pipes. 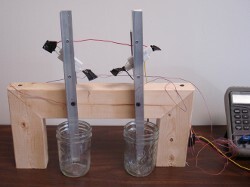 In each case, a pair of magnets is arranged on either side of the incoming water pipe. They are oriented so that they are attracting towards each other, which makes a strong, uniform field within the pipe. Some means of fastening the magnets is required to hold them in position, preventing them from falling off the pipe or slamming together.